In case you were not aware of our brand new offer called the "Featured Client of the Month" then it is time to learn! Marketing is a tough job to try and do in the insurance business since we technically don't have a tangible product that you can touch. Of course you can touch and see your printed policy, but after you see it once it goes right into your cabinet and sits there until it is needed. You cannot play with your policy, eat your policy, dance with your policy because it just isn't that kind of product (unless you do... then in that case by all mean keep on doing what your doing). The point I am trying to make is that trying to selling insurance compared to a product such as a granola bar is like night and day. We can't send out samples for you to try or give you a 30 day free trial on your insurance policy, it just doesn't work like that. I am currently a marketing intern for AJM Insurance and I am about to go into my senior marketing student at Seton Hall University. While taking marketing classes one of the main things I have learned about is social media and how to utilize it to it's maximum to market your brand or product. Everyone is online and I am pretty sure most people check their Facebook and Twitter more often than they do the daily newspaper. So I wanted to use my internship to really try and test my social media knowledge and learn as much as possible within the few months I am here. Everyday I see our sales representatives walking around, flipping through files, and stopping to take a breathe and get a drink of water. Everyday I try and catch one of them while they are heating up food or getting water just so I can hear a "Snapple" fact or little nugget of information that I can learn from. I always hear something like this, "Yesterday I had to meet with a client about his/her policy. Yeah his/her business is going pretty good at the moment. Turns out he/she is a Phillies fan which really funny, we even like the same player.The fella/lady was as nice as could be. Well I gotta get back to work!". After dozens of conversations I had with these sales reps. I started to notice a crystal clear theme. That theme is that they treat every customer with the utmost respect and kindness, just like family. This got me thinking... why not market our business partners who have policies with us! Many of these business partners are small or medium sized and we are still pretty small on the East Coast as well. So why not play up the "underdogs"! The economy is tough and everyone knows it, so why not be kind and do some sort of free marketing on social media for both AJM and the other business partners. I then thought about what a family does. They nurture each other and help them out when times are rough... so I figure why not help our family out by creating the "Featured Client of the Month" deal! Right! Now back to business! What we want to do for any and all of our business partners is promote their business through our Facebook page & blast email. The idea is that the business partner would come to us with a specific discount/coupon in mind and we would use our social media app. to promote them on our Facebook for FREE. Keep in mind this is 100% free, this is our treat to our loyal clients! The app. we use allows us to create coupons, forms, media galleries, voting galleries and more all with a variety of templates. We are currently using Strutta (in case other marketers were wondering) and they are wonderful, easy to use, and 100% fair priced. We do the graphic design for the banner page, intro page, and coupon for whoever the client is. We also do the wording for each Facebook post and blast email that we send out (don't worry I make you sound like the best thing since sliced bread haha). Check out our Facebook page to see examples of what is already done. So each month we are going to have a different client, offering a different coupon! Now this is where the social media part comes into play. 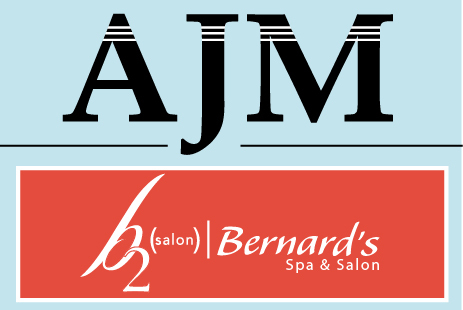 The coupon will only be able to be claimed and printed off of the AJM Insurance Facebook page. Keep in mind that the coupon is free to be claimed and we do not ask you for any personal information. If this months deal does not appeal to you then tell your friends about it. All you have to do is "like" our Facebook page and that's it. This is something to get business rolling for our business partners and a great deal for those who follow us! August's "Featured Client of the Month Deal"
This months client is our business partner Bernard's Salon and Spa / b2 Salon by Bernard's. The coupon is for $25 off any service over $50. This deal lasts only for the month of August. So please check out the AJM Facebook page and support us on this brand new journey through social media. If you have any suggestions or thoughts on what we can do then please do not hesitate to comment on this post, call us here at AJM, or leave a comment on our Facebook page!